Quick question, how many Cy Youngs has Nolan Ryan won? Most people associate Ryan with his strikeout achievements and 7 no-hitters and thereby assume maybe 1 or 2? Astonishingly enough, the answer is 0. Despite being an 8-time all-star, leading the league in strikeouts 11 times and being a 2-time 20 game winner, Ryan only managed to finish as high as second place in Cy Young voting. 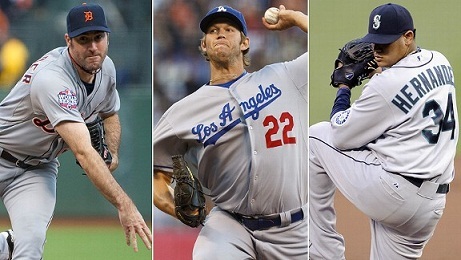 Granted, there can only be 1 best pitcher in each league, and deservedly so. However (to borrow a line from Talladega Nights), it seems like “if you ain’t first, you’re last”. There is little hardware or recognition given to pitchers who consistently pitch well and/or are among league leaders every year. Therefore, I propose MLB introduce a new award (name TBD) that honors the best 5 rotation pitchers in each league every year. This would be akin to the NBA All-NBA team, except MLB choses to have separate league awards. Since there is already a Relief Man award given out, we can eliminate relievers from this honor. A Cy Young winner is therefore not guaranteed to win this award (think Dennis Eckersley, Eric Gagne). Hitters already have supplementary awards like the Silver Slugger honoring the best at each position and Hank Aaron award given to the best offensive player. It’s time to give pitchers some additional love. This new award would highlight pitchers who consistently perform at a high level (think Greg Maddux, Randy Johnson), while also calling out the 1-hit wonders (think Jake Peavy, Barry Zito). Having multiple pitchers from the same team win the award could help debate who had the greatest rotation of all-time (think Braves from the mid-90s). Sure, Ryan does not stack up to any of those above him, but at least it gives the man some honorable accolades for an otherwise standout career. I’d leave the final call to the people… as long as I get royalties if this award comes into fruition, got it Bud? This entry was posted in Sports and tagged MLB. Bookmark the permalink. Both comments and trackbacks are currently closed.